The western approach to the Ross Island Bridge (here looking east) was a somewhat less complicated affair in 1932 than it is now. A tangle of streets and ramps now covers the bare lots on the left of this image, and I-5 now cuts under the bridge approach, all along the top of the photo. Corbett Avenue crosses the very end of the bridge ramp while Front Avenue, with the streetcar, crosses the bottom of the photo. Great photo! Lots of interesting things going on. Besides the streetcar you can see the Oregon Electric yard and line in the upper left hand corner. Just below the yard I believe you can see a small sliver of vacant lot. I believe that’s the former Hebrew Cemetery-Beth Israel Congregation. To the right of the picture you can see Ross Island Grocery’s former location (prior to their move last year up two blocks) on Corbett. Also, I believe the other railroad line at the top of the photo is the Southern Pacific Jefferson Line. I think they were just discontinuing the Red Electrics about this time. Great stuff and keep up the good work. Is that a traffic signal or a monument at the roundabout entrance to the bridge? It’s tough to make out. Looks like most of the residential blocks south of the bridge are pretty much intact today. I like walking around this area on random Sunday mornings during the summer. Just had a cup of coffee at Ross Island Grocery’s new place last month! 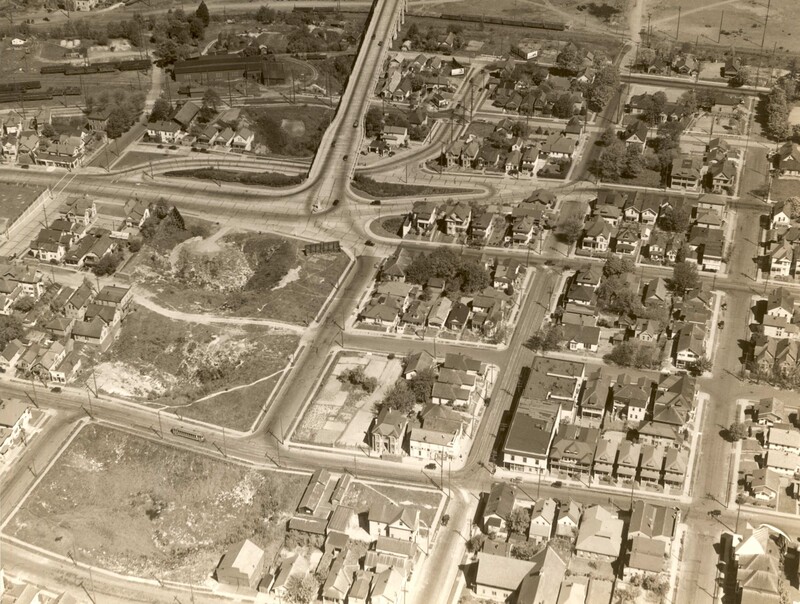 Dan – are there any pictures around of the old Brooklyn Town Center area which was demolished just a few years prior to this to build out the eastern approach of the bridge? To think what a great two-lane bridge is was that later became four very narrow lanes with wide sidewalks on both sides. Then it became a white knuckle drive for everybody where lots of outside mirrors were broken at the least. I get excited whenever this neighborhood shows up on this blog. I want to see an old picture of my house. This is the closest it’s ever gotten. It’s literally the very next house next to the one that is cut off on the left side of the picture at the center. So frustrating… please go back in time and retake this picture just a little to the left. I noticed the grand house in the center lower (near front and gibbs). You all are amazing, I can’t keep up. Please help! In present times, our Lair Hill house (built in 1884) sits directly behind Front and Curry Community Garden on Pennoyer Street (originally Davis). Check this out: I just learned through National Historic blah blah blah that in 1946, our ‘historic’ elephant was moved from its original location at 3527 SW Front Avenue to its present site!!! It’s named Gundoph, Ferdinand, House #1, and there is a #2 that stands right next to us today. Perhaps wishful thinking, but I spy two matching houses [from behind] facing Front Ave. [in this picture] with the same roof line as our(s) in lower rt. hand corner. Second block in from left-middle-left of that block. I think they stand on what is now the Community Garden. Do the addresses match (is that what was once 3527 SW Front)? What once stood where the gardens stand today? Why on Earth did they relocate our houses around the corner? Anyone?